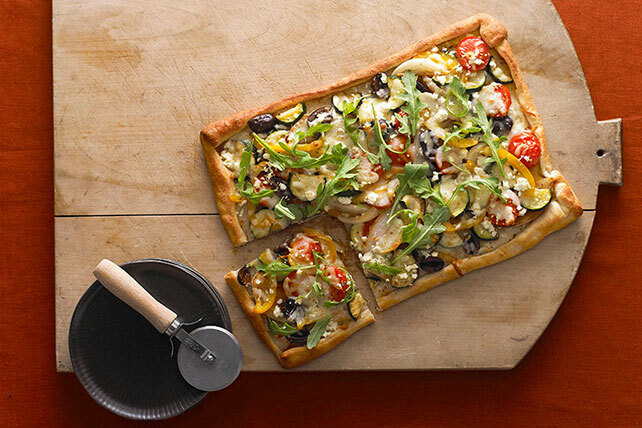 This pizza stars skillet-browned onions, peppers and zucchini topped with feta and mozzarella. And it can be on the table in about 45 minutes. Heat 1 Tbsp. dressing in large skillet. Add onions; cook and stir on medium-high heat 5 min. or until crisp-tender. Add peppers and zucchini; cook and stir 5 min. or until onions are golden brown and peppers are crisp-tender. Remove from heat; stir in tomatoes and olives. Unroll pizza crust on baking sheet sprayed with cooking spray; pat into 14x10-1/2-inch rectangle. Fold over edges of dough to form 1/2-inch-wide rim. Bake 5 min. Brush with remaining dressing; top with vegetable mixture and cheeses. Bake 12 to 14 min. or until edges of crust are golden brown. Top with arugula. Add 1/4 tsp. crushed red pepper to vegetable mixture in skillet with tomatoes and olives.